Break out the bubbly: Grand Cafe in south Minneapolis is one of Food & Wine magazine’s Restaurants of the Year. "It's so exciting," said chef/owner Jamie Malone. "It feels amazing, and there's always a level of disbelief." 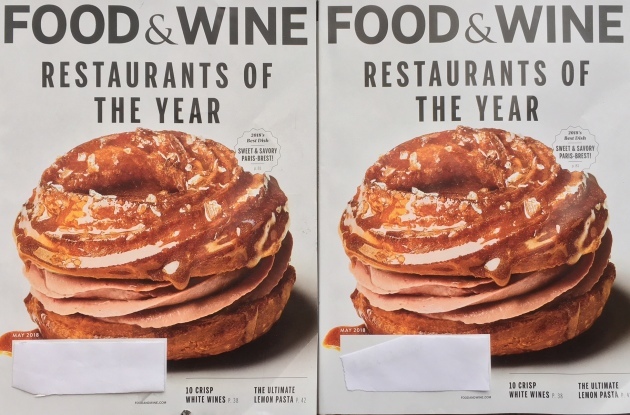 There’s more: Malone's exceptional sweet-savory variation on the Paris-Brest, described by F&W as “a swirl of choux pastry that’s painted with black honey and sandwiches ethereal chicken liver mousse,” was also named the magazine's Dish of the Year. An image of the delicacy graces the cover (pictured, above) of the glossy’s May issue. The fourth-annual list features restaurants that have opened during the past 14 months. 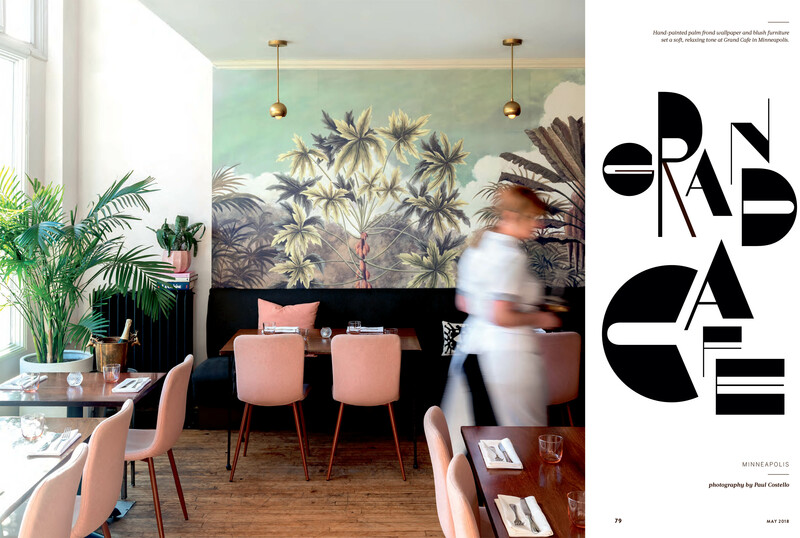 (That's the restaurant's four-page spread, above, with images by Paul Costello). Rothman spent six months – and logged 37,000 airline miles – as she dined in cities across the country. Others on the list include Better Luck Tomorrow in Houston, Fairfax in New York City, Junebaby in Seattle, Kemuri Tatsuya in Austin, LASA in Los Angeles, Maydan in Washington, D.C., Reem's in Oakland, Superior Motors in Braddock, Pa., and Voyager in Ferndale, Mich. Both Malone and her restaurant -- led by chef de cuisine Alan Hlaeben, sous chef Britt St. Clair and general manager Nikki Klocker -- have been the recipients of national praise in recent months. The James Beard Foundation placed Malone on its semifinalist list for Best Chef: Midwest, and Grand Cafe was a Beard semifinalist for Best New Restaurant. Malone is no stranger to the Food & Wine spotlight. 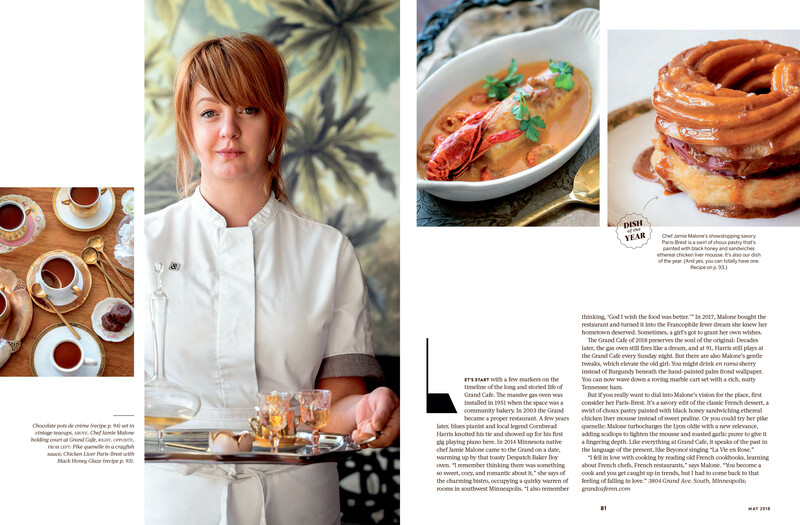 In 2013, during her tenure at Sea Change, she was one of the magazine's Best New Chefs. Grand Cafe isn’t the first Twin Cities restaurant to land a berth on F&W’s Restaurants of the Year list. The former Brewer’s Table at Surly Brewing Co. was lauded in 2016, and Spoon and Stable made the cut in 2015. The story also features three Grand Cafe recipes: Chicken Liver Paris-Brests with Black Honey Glaze, Milk Chocolate Pots de Crème and Poached Leeks with Sauce Gribiche. Although the cover image was a surprise ("I didn't know about that until I saw the magazine, and I was absolutely shocked," she said), Malone has known about the story for several months, and has kept the news under wraps. "They make you keep it a secret," she said. "I might have slipped it out to a few core people on our team." As for celebration plans, "We haven't figured that out yet," said Malone. "But whatever we do, there will be plenty of champagne."